What do you think is the first thing you need to start sending emails? Good copy. Sure, but even before that. A list of prospects. Obviously, but before that. It may seem kind of confusing and not so obvious, as the thing you need first is actually at the end of your email. It’s a signature. This post was originally published on 19 Feb 2015, and updated on 08 Feb 2018. What makes a signature neat and professional? What makes a signature useful? What I put in my email signature? What makes a signature consistent? Should everyone in the team have the same types of info in their signature? The problem is, it shouldn’t be “a” signature. It should be the signature that makes your addressees contact you back, or check your social media accounts, or take any other action you want them to take. And that’s where the party starts. It’s a small thing that is a big deal. 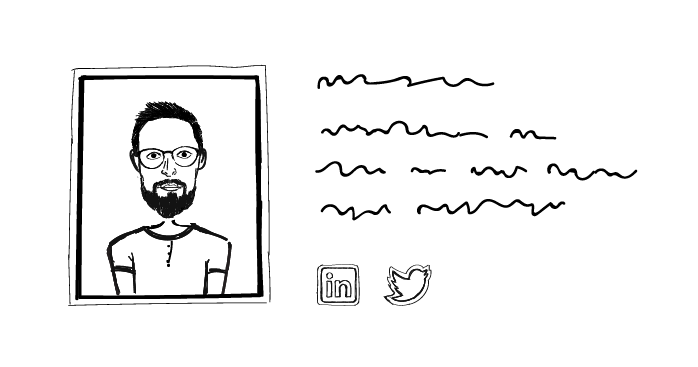 And I didn’t even realize that until I was to decide what my new email signature should look like. Should it contain all the info or just some crucial pieces? What are the crucial pieces that I cannot omit? Should I use a photo or not? Should I use images for social media links or not? Should I use a traditional sign off or something memorable? Should it be html or simple text? And this is just a signature! What I did at the very beginning was to reach out for some advice to others who already faced this problem. What I found were four dozen pieces of advice and best practices. The problem was, some of them were in contradiction to one another. “Make it look awesome, but simple,” “Add a memorable photo, but try to avoid too many images as many email providers block images by default,” “Put all the info your addressee will need to contact you, but keep it short,” and so on. In such a case, I needed to put all the pieces of advice through the sieve of our purposes and decide what’s going to work best for us as a company. It should look neat and professional. Of course, we all would love our company signatures to look great: clear, attractive, professional, trustworthy. Personally, I’d love for our signatures at Woodpecker to correspond with our brand. My goal would also be, aesthetically speaking, to enhance the most crucial bits of information, so that the signature can be easily comprehensible to my recipient even after they just take a brief look at it. We decided to spend some time on the designs of our company signatures because that’s how we will be able to make a good impression on our cold email recipients and our customers. But while planning the looks of your signature, it’s good to keep in mind its purpose above all. For instance, if I’m going to use my signature in cold emails, I can’t use too many images, as images will get blocked by default by many email clients. As a result, my prospects won’t see it, unless they specifically allow their email client to access remote content. Hence, my email as a whole may not look very persuasive or encouraging. And that’s how my signature could drag down my reply rates. There’s also another thing to be aware of when putting together an email signature. Even a great looking signature may decrease your deliverability rate if it’s made up of messy html. The way you see a signature, and the way emailing systems see it may be two totally different views. There are some services online which allow you to use an html signature template without any coding. You just enter your data, click a button, and copy a longish piece of html to paste it into your email client settings. The signature may look fine in the email. But what the html is made up of may be spaghetti. From our experience, this approach may cause serious deliverability issues later on. That’s because such a long and messy piece of html will then get added to the html of each of your email messages. And if there’s too much html in comparison to the amount of text in a message, such an email will not look trustworthy to many anti-spam systems. In short, a messy html of your signature may get your emails into spam folders. All in all, if you’re going to use an html signature, ask a developer to code it from scratch, or at least ask them to make sure if the template you’re about to use looks tidy in terms of html and isn’t too long. That’s what I figure out about the looks. Now let’s get to usability. The shortest possible answer is: it depends. I came across this article by Justin McGill, who draws attention to the importance of a well-thought-out signature in cold emails. Bingo! He says: ‘put all the contact info in the signature.’ That may be useful, from my perspective: the more contact info I have in there, the less space I need in the body of my email to introduce myself and give directions to contact me. And the first golden rule of cold email is to keep it short. Nonetheless, I care even more about the signature being useful to my addressees. And that’s why I took advice from the article by Stephanie Vozza who says, ‘give one or two of the best ways to reach you’. That’s a must. Full stop. This may be an interesting part to test in your cold email campaigns. I’ve heard a hundred times that “you shouldn’t put the word sales in your email signature because that scares people off.” So instead of Sales Representative, you can often see Business Development Rep, Growth Manager, Growth Expert, and the like. I think that’s something to test out. Perhaps, if you’re targeting salespeople they would be happy to talk to another salesperson. As always, very much depends on your target group. In both, the initial and in the updated version, I decided I’ll skip the email address, because it seems redundant to me. If someone got my message, all they need to contact me back via email is hit the reply button. Or am I missing something? 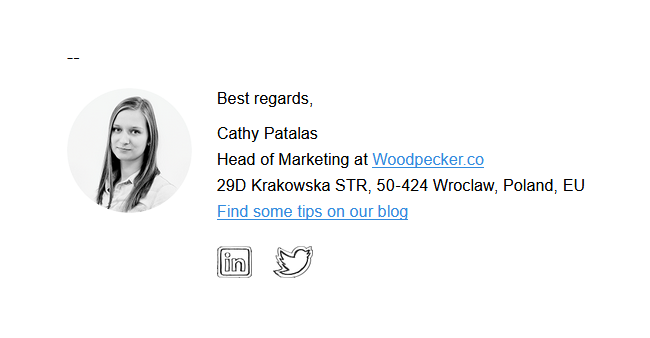 When working on the first version of our company email signature, I thought we didn’t need to include our company address, as our addressees wouldn’t be local prospects. Hence, they wouldn’t need the physical address. Look more trustworthy and legit as a company in the eyes of our prospects. Stay 100% compliant with the law of all the countries we send our cold emails to. Some countries, including the US, require a physical address in cold emails. Giving a link to our website seemed more than obvious to me. A website is the first point of touch I’m looking for after receiving a decent cold email. A website is a must-have for me. And I assumed it will be a must for most of my prospects as well. Well yes, they can. But that would definitely take much more effort than just clicking a link I give them in the signature. Less effort = greater chances for a reply. Give it a try, as long as it’s relevant to your target group. I’ve added a link to our blog in my signature. No matter what links you add, test out all of them – they have to be working every time someone clicks on them in your email. Your sender reputation, and hence your deliverability rates, depend on such small things that are easy to omit by accident. I’ve included my Twitter and LinkedIn accounts – in the first version just as links, in the updated version as images. I thought more than two social profiles would be too much, but this is a decision you need to take for yourselves. I decided to choose Twitter and LinkedIn, because these are the platforms I contact people at work. But if you prefer Facebook, or YouTube, or any other platform, that’s perfectly fine as well. Just keep in mind that the accounts you share should be alive. There’s no point in giving a link to your Twitter if your last tweet was in May 2015. Remember, it should make the signature useful. Your prospects will click on the social media accounts to see who you are, what you’re interested in, what you can help them with. Your social profiles should offer this type of information. Should I put my phone number in the signature? Again, that depends. If you put your phone number in the signature, you must be ready to pick up the phone once someone uses it. In my case, my prospects would probably get to the voicemail 80% of the time, since we are on two different continents – and that’s would not be very useful. So I’d rather them email me back and schedule a phone talk if they wish to talk. If you’re in sales, targeting people in your own time zone (or at least in a time zone close to your own) and you work on the phone a lot, it would probably make sense to put your phone number in the signature. It makes sense as long as your prospects can actually use the information you gave them and don’t get disappointed. We also decided we would all add our photos when we got them taken right – vide: when they will be consistent. That’s why the first version of the signature did not involve a photo, but we’ve put it in the updated version. We wanted the photo to look professional, yet still presenting us as the people we really are. And what about the sign-off? I couldn’t come up with anything sparkling-yet-not-cheesy enough to put it there, so I decided to stick to the traditional ‘Best regards’. It survived untouched through the update, so it’s still there today. Consistency concerns not only a single signature, but a whole set of them at a company. Our vision was to have all the team members using the same signature template – with the same fonts, a similar style of photo, and with the same structure of information. This vision was realized only in the second version of the signature, so now I can honestly say our company signatures are consistent. They are consistent across the whole team and graphically consistent with our brand. Finally. You wouldn’t believe how much time it takes to gather all the information, collect or take all the photos and put it together in one place, so that a developer can work out a consistent signature template ready to use for everyone in the team. We assumed that the signatures should be above all useful. They are consistent in terms of the structure, but salespeople have slightly different types of information than marketing people, for instance. It all depends on how this information can be used by various email addressees. Here are two versions of my signature, so you could see what I’ve been writing about through all this post. The first one and the updated one. Be aware of your business needs and the purpose of your emails – think of how the signature can be useful to your email addresees. Don’t waste precious email space for useless ways to contact you, or links to some social profiles you forgot about years ago. Be empathetic towards your addressees – think what will make them encouraged to contact you back (and how they can do it easily). Be attentive to technical details like html structure – a poorly coded signature may not only render poorly to your email recipients, but it may also negatively affect your email deliverability. If you’re about to decide between a fancy looking signature from a template and a simple text signature, go for the first one. If you’re going to use html, have it prepared by a developer or at least checked. Be open to testing and changes – I know that we all would rather fix it once for good and don’t look back (that’s what I feel, at least), but the little big thing at the end of your email really does matter in terms of reply rates in your cold email campaigns. Previous postHow Should I Take Care of My Brand Online Before Email Outreach?